6 Brioche swirls with crème patissière and chocolate chips. 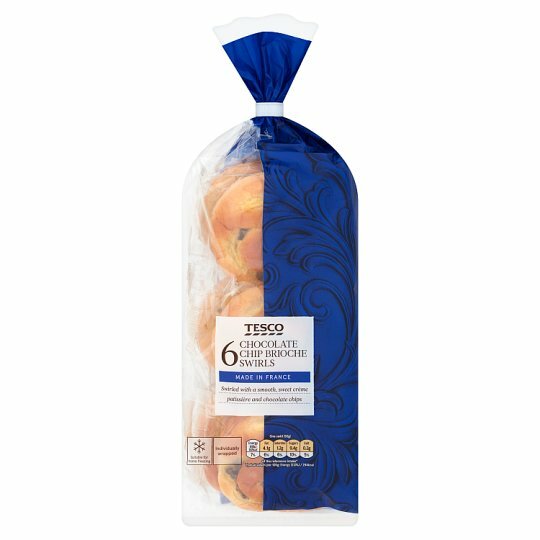 Made in France Swirled with a smooth, sweet crème patissière and chocolate chips Our brioche swirls are individually wrapped for freshness and convenience. Crème Pâtissière (39%), Wheat Flour, Pasteurised Egg, Chocolate Chips (8%), Sugar, Rapeseed Oil, Yeast, Salt, Emulsifiers (Mono- and Di-Glycerides of Fatty Acids, Polyglycerol Esters of Fatty Acids), Preservative (Potassium Sorbate), Colour (Carotene), Flavouring. Crème Pâtissière contains: Water, Sugar, Dried Whole Milk, Modified Potato Starch, Pasteurised Egg, Dried Egg White, Wheat Starch, Preservative (Potassium Sorbate), Thickener (Methyl Cellulose), Flavouring, Colour (Carotene). Chocolate Chips contain: Sugar, Cocoa Mass, Cocoa Butter, Emulsifier (Sunflower Lecithins), Flavouring. May contain Nuts. For allergens, including cereals containing gluten, see ingredients in bold. Also, may contain peanuts and nuts. Suitable for home freezing. Ideally freeze as soon as possible after purchase but always by date shown. Defrost thoroughly for a minimum of 2 hours in a cool, dry place. Bag clip may pose a choking hazard.Warning: Plastic bags can be dangerous.To avoid danger of suffocation, keep this bag away from babies and small children.